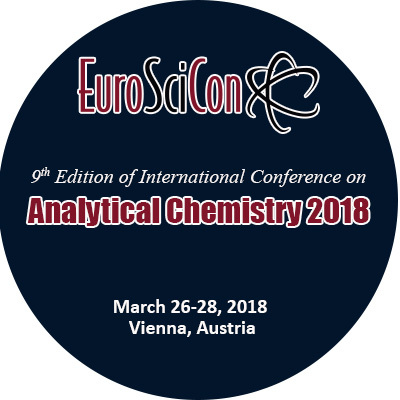 9th Edition of International Conference on Analytical Chemistry, March 26-28, 2018 in Vienna, Austria. Theme of the conference focuses on Exploring Novel Advances and Applications in Analytical Chemistry. Analytical Chemistry 2018 will provide an unprecedented opportunity for chemists of all stripes and colors to share their research with colleagues by discussing the latest advances in the field. We invite directors, presidents & CEO’s from companies, chemists, academic groups, directors from pharmaceutical companies. Laboratory scientists who identifies, quantifies, analyzes or tests the chemical or biological properties of compounds or molecules or who manages these laboratory scientists. Chemical researcher, molecular diagnostics, clinical laboratories, health care industry, quantitative analysts, qualitative analysts, editorial board members, students, faculty members. chemical instrument vendors, professors and students from academia in the field of analytical and bioanalytical sciences. Delegates from various pharma & instrumental companies from all over the world. About hosting organization EuroSciCon is one among Europe’s largest and most significant scientific place which serves as a crossroad for the academicians and industry experts to build networks. With over 16 years of life science communication it focuses on to spearheading the transformation of medical research into knowledge through scientific gatherings and networking. Supporting the Rare Care UK Organization, EuroSciCon is a corporate member of Royal Society of Biology, Institute of Biomedical Science (IBMS) and British Society for Immunology. Our approach has always been unique and that difference has propelled our growth towards scientific serendipity.